This newly released NASA image shows wind carved rock on the surface of Mars. The distinctively fluted surface and elongated hills in this image in Medusae Fossae on Mars are caused by wind erosion of a soft fine-grained rock. 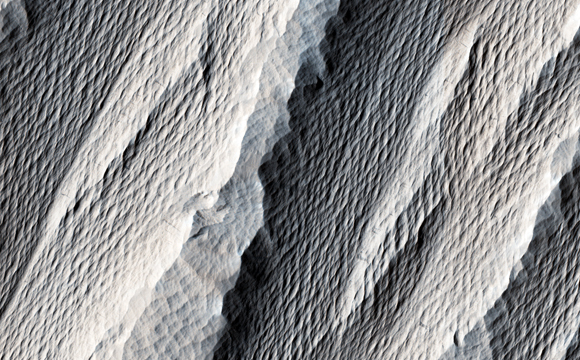 Called yardangs, these features are aligned with the prevailing wind direction. This wind direction would have dominated for a very long time to carve these large-scale features into the exposed rock we see today. The image was acquired at 15:25 local Mars time on June 28, 2016, by the High Resolution Imaging Science Experiment (HiRISE) camera on NASA’s Mars Reconnaissance Orbiter. Yardangs not only reveal the strength and direction of historic winds, but also reveal something of the host rock itself. Close inspection by HiRISE shows an absence of boulders or rubble, especially along steep yardang cliffs and buttresses. The absence of rubble and the scale of the yardangs tells us that the host rock consists only of weakly cemented fine granules in tens of meters or more thick deposits. Such deposits could have come from extended settling of volcanic ash, atmospheric dust, or accumulations of wind deposited fine sands. After a time these deposits became cemented and cohesive, illustrated by the high standing relief and exposed cliffs. Be the first to comment on "Mars Reconnaissance Orbiter Views Wind Carved Rock on Mars"